Roasting the vegetables adds a smoky flavour to whole grain stuffed shells with a new twist. 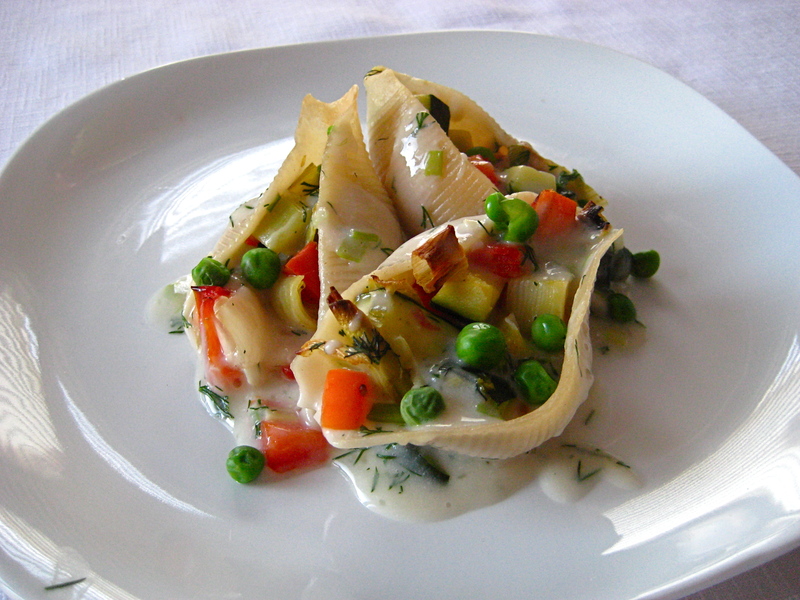 The creamy sauce is deceptively rich, infused with garlic and fresh dill. Bring a large pot of salted water to a boil. Add noodles and cook according to package directions. Drain well. Preheat oven to 450°F (230°C).Toss all chopped vegetables, except for peas, with olive oil. Sprinkle with salt and pepper and spread on a baking sheet in a single layer. Bake for about 20 minutes, stirring often, until tender. Lower temperature to 375°F (190°C). To make the sauce, heat the oil in a medium saucepan. Add the garlic and scallions, stirring for about one minute, until fragrant. Add the arrowroot, whisking quickly, adding nondairy milk, a little at a time, to keep it smooth. After a few splashes, it should be a thick paste. Add the rest of the milk, continuing to whisk. Bring to medium heat, whisking frequently, allowing to cook until thickened, about 10 minutes. Add salt and pepper to taste. Stir in dill. Once vegetables are finished, spread a bit of the sauce mixture in the bottom of a 9×13 pan. Arrange noodles, stuffing each with about two tablespoons (30 ml) of filling. Top with additional sauce. Bake for about 20 minutes. Let sit 5 to 10 minutes before serving.